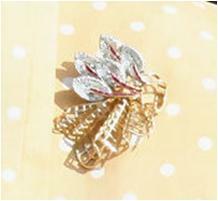 Occasionally used by the Queen today, this brooch includes a folded gold net or trellis work with five lilies or leaves in diamonds with ruby stems. It is another of her wedding gifts from 1947, and can be seen displayed with the rest at the time. 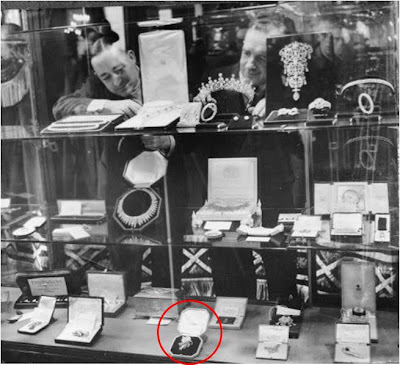 Exactly which wedding gift it might be is unconfirmed, but the present from the director of Garrard seems likely, as it was described as "a ruby and diamond trellis gold brooch". There are other unidentified brooches on the wedding gift list, though, including a "gold brooch set with diamonds and rubies in a trellised floral design" from the Principality of Monaco, or a ruby and diamond brooch from the Margravine of Baden, Prince Philip's sister. There are other possibilities for these gifts, though, including the Ruby and Gold Flower Brooch. The Queen uses it occasionally these days, typically capitalizing on the gold and ruby tones in the brooch by wearing it with yellow, gold, pink, or red outfits.